There are several ways to do most things in Photoshop, and using the art history brush to create a painterly effect is no different. I’m going to show you ‘one’ way to do it. 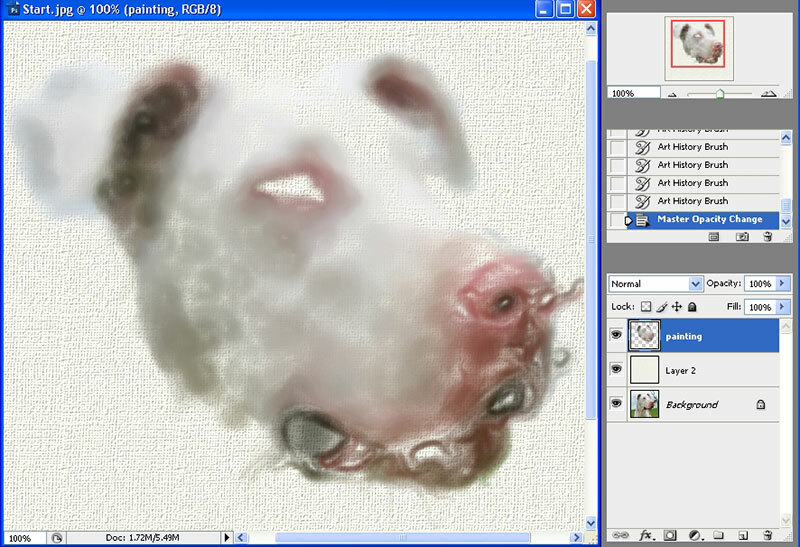 If you can find a really good video on the net to show you how to use the art history brush, it would be a great idea. 2) Similar to the history brush, the art history brush needs a corresponding layer in the layers palette to the *snapshot* layer in the history palette. 3) It is better to slowly build up an effect than to try and slap it on all at once. 4) Remember to save your file in the .psd format often. Once you’ve initially saved it, you can just go to File>Save or Ctrl + S to update it. Before we start, lets have a look at what I mean by ‘the brush engine’ is your friend. If your brush engine/palette isn’t visible go to Window>Brushes or press F5 on the keyboard. 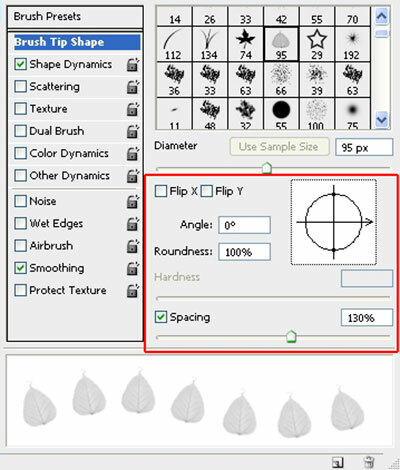 Those familiar with the brush engine will know that it is the place to set up your chosen brush so that it does exactly what you want it to do. This can come in pretty handy when doing painterly effects. Lets have a look at setting the direction of a brush so that it will follow a chosen line and the tip will go in the correct direction. I have chosen a standard Photoshop brush for this – Autumn Leaves – I have gone through and unchecked all the default settings except smoothing, and set the spacing to 130%. In the first example I’ve drawn an S shape with the brush (on the left). You can see how the leaves have stayed in an upright position. In the second example (on the right) I have gone to Shape Dynamics>Angle Jitter>Control and chosen Direction from the drop down menu. 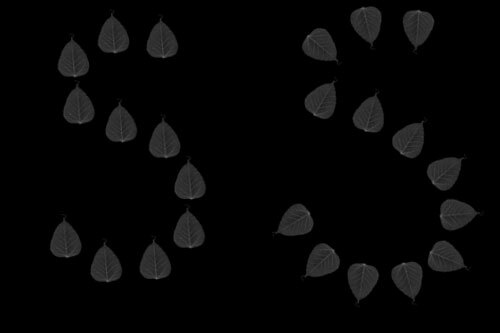 You can see how the leaves have now followed the direction of the S shape. See image below for another area that you can fiddle around with to get some different effects for the brush. And one final thing that you can do with brushes, is to make a dual brush. 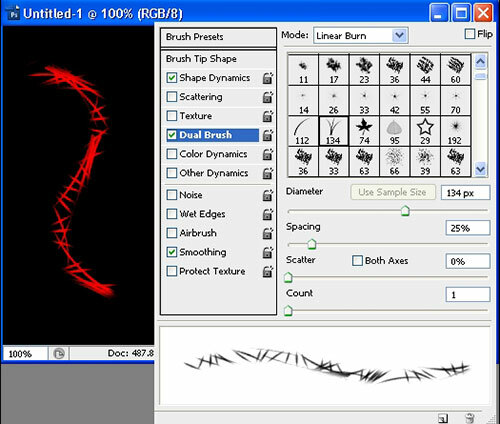 Go ahead and pick a soft edged brush from your brushes, open the brush engine, pick Dual Brush from the left menu and then click through the various brushes till you get an effect in the preview window that you like. If you have a blank canvas open you can even try the brush and see what it looks like. I chose the Grass Brush to come up with the effect in the image below. You can also change the attributes of the second brush and the blend mode. Just before we get going, it is important that you build up any effect slowly/gradually. This can make painting a rather drawn out affair, but you can get some fantastic results if you’re willing to take the time. Remember that there are loads of different techniques out there for painting – choose one that suits the way you like to work – mix the different techniques together etc., example – when we finally get to the art history brush you will find a drop down menu where you can use the brush to Lighten, Darken etc., I choose not to work with them, I prefer to use the Dodge and Burn tools on 50% neutral grey layers set to soft light. Also remember that you can still use standard adjustments during and after to make your painting special. So lets get started. Before you start painting, do any necessary adjustments to the image i.e. colour correction etc., In other words, start painting with a finished image. I haven’t bothered with the start image here, I simply cropped out some of the excess trees to the right. Open the image and duplicate the layer by pressing Ctrl + J on the keyboard or dragging the layer to the create new layer icon at the bottom of the layers palette. At this point you can add an effect to the duplicated layer if you want (entirely up to you). I chose Filter>Brush Strokes>Spatter with a Spray Radius of 2 and Smoothness set to 5. With the top layer active, hold down the Ctrl key and click on the create new layer icon at the bottom of the layers palette – this will force the new layer, below any active layer. What we’re going to do here is set up a canvas. You don’t have to do this part if you don’t want to, but you might want to use it one day. Turn off the topmost layer and fill the blank layer with a colour of your choice. 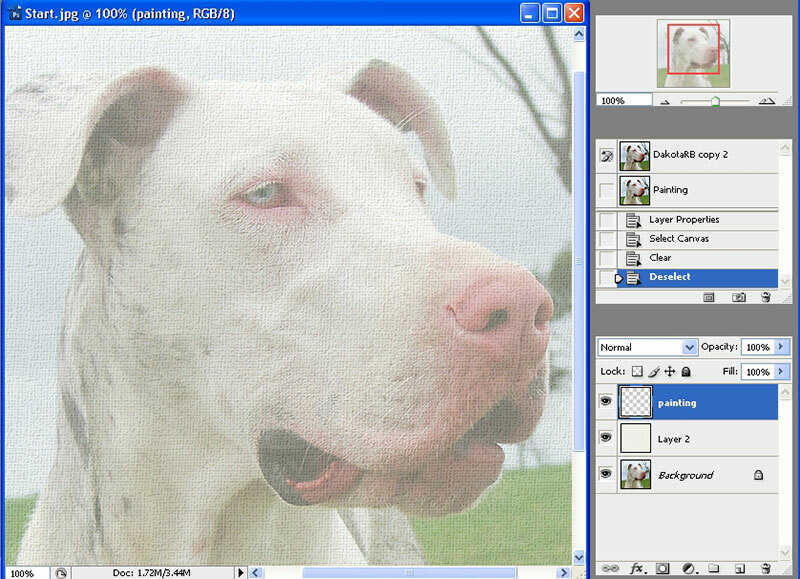 I chose a cream colour, go to Filter>Texture>Texturizer and choose Canvas – pick some settings to suit and take the opacity of the layer down to about 50%. Turn on the topmost layer again and take a snapshot of the image – in the history palette, name this layer painting/underpainting or something similar. Rename the layer in the layers palette the same thing. Once you’ve done that, click on the painting layer thumbnail in the *Layers* palette then Ctrl + A to select all – press the delete key to delete the contents of the layer and then press Ctrl + D to deselect. You should end up with something similar to the image below. If you made a canvas layer, click on that and then take the opacity all the way down. Click back on the painting layer and go to the side tool bar and select the Art History Brush, or you can press Y on the keyboard – if the History brush tool comes up, hold down the Shift Key and press Y again to scroll through to the Art History Brush. In the History Palette, click in the little blank square of the Painting layer to the left of the thumbnail to set this as the source. 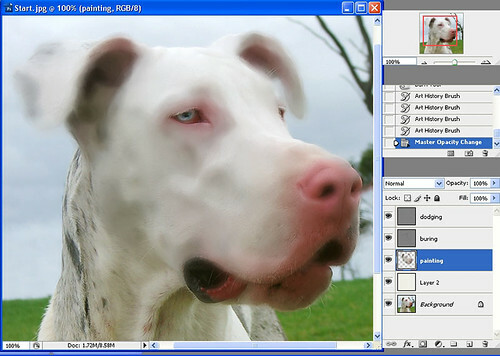 Clcik on the corresponding layer in the layers palette. Now you have to go and select a brush. Remeber the bits of information about the brush that I gave you at the beginning. There are plenty of free brushes available on the net as well. I’ve chosen a Photoshop default brush – Dry Brush. I’ve gone to the brush engine and chosen direction from the menu and turned off everything else except smoothing. You will be presented with a top toolbar – see image below. This is where you’ll choose the mode, opacity, style, area and tolerance. The settings you see in the above image, are the settings I’ve chosen to work with. Time to check – Painting layer selected in layers palette, art history brush icon in the square next to the painting snapshot in the history palette, settings for the art history brush changed to suit ….. lets begin. Short, sharp, small strokes of the mouse or pen will work the best. Go in the direction of the fur and zoom in really close to see what’s going on. If you need to scroll, hold down the spacebar and you will temporarily get the small hand icon so you can move the image. Change the size of your brush on the fly by using the left and right square bracket keys on the keyboard (situated near the P key) Left makes the brush smaller, right makes it bigger. 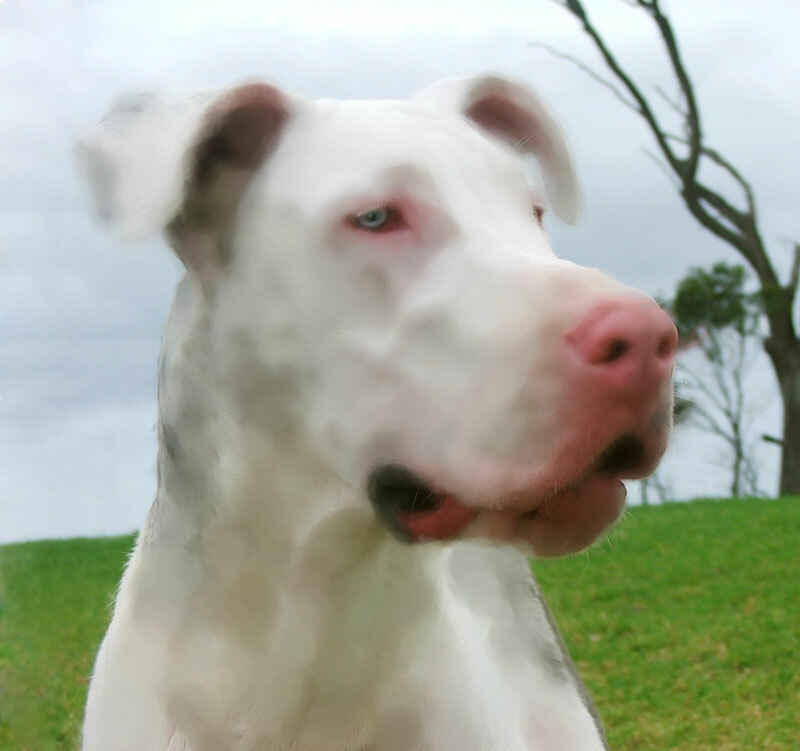 In the image below I’ve roughly gone over the head area of the dog excluding the eye – if you click on the canvas layer you made, and return the opacity to 100% you will see what is going on without seeing the image itself. 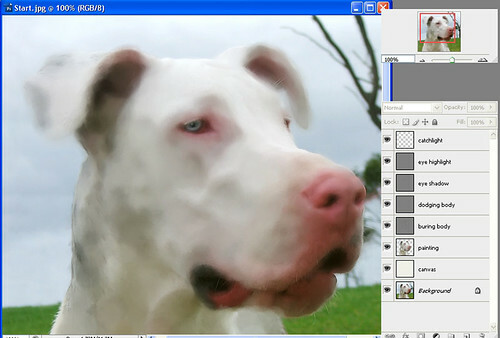 Reduce the opcity of the layer and click back on the painting layer in the layers palette. Ignoring the anything below the head area (cos I just quickly swiped over it – that thing I told you not to do LOL), you can see how easy it is to start building a painterly effect. You would of course, take much more care and time. Added by admin on April 8, 2010.